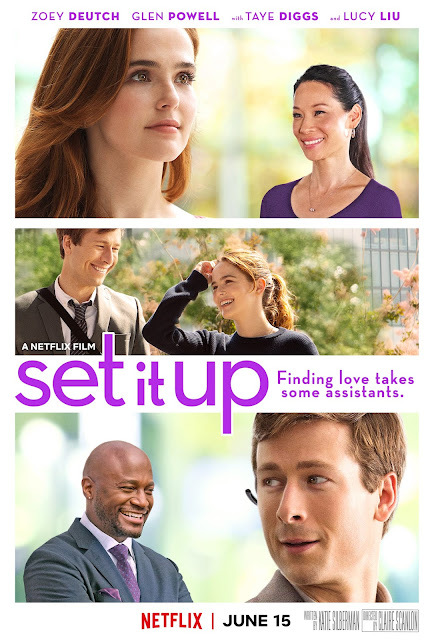 Home / NETFLIX PRESENTS / Netflix Releases "Set It Up" Original Film Today, June 15! Netflix Releases "Set It Up" Original Film Today, June 15! The "Before I Fall" star Zoey Deutch returns in a movie via the web-based entertainment media Netflix together with Glen Powell, Taye Diggs, and Lucy Liu in the office romantic comedy film, "Set It Up", a Netflix original film which is showing starting today, June 15 and can be viewed online via streaming on Netflix. From Novel to Movie - "Before I Fall"
In the Netflix film, Zoey Deutch and Glen Powell play Harper and Charlie, respectively, are two overworked and underpaid executive assistants beaten down by Manhattan’s rat race. Barely aware of their own deferred dreams, these twenty-somethings live to serve a pair of tough bosses in the persona of Lucy Liu and Taye Diggs, who whip them into a daily frenzy. Teaming up out of sheer desperation, Harper and Charlie hatch a plan to become secret matchmakers to each of their boss and getting their bosses off their backs by luring them into a fake romance. But what starts out as a brilliant maneuver quickly spirals out of their control as they realize that being the puppet masters is not as simple as it seems. Below is the official movie trailer for "Set It Up" exclusively showing on Netflix.